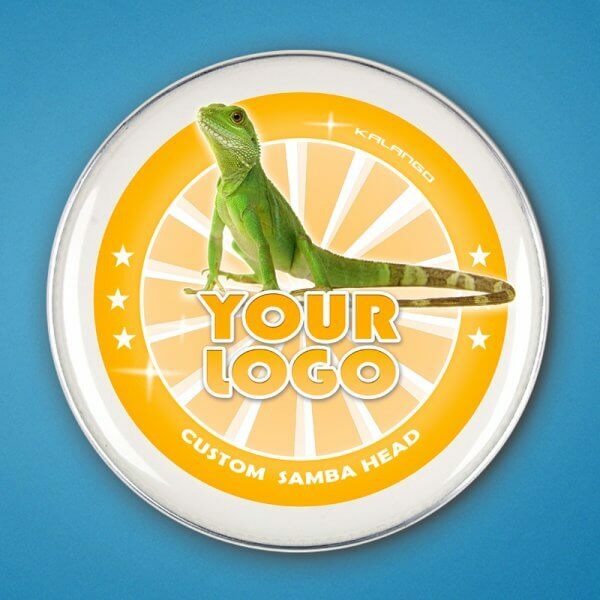 Get your customised Samba heads with your band logo on - it's super easy! We print your logo in top quality and brilliant, photorealistic colours. With our state-of-the-art print technique, the colour does not come off through abrasion and has no influence at all in the sound quality. The optical kick for your bateria - authentic look like in Rio and Salvador! We use the latest print techniques for the custom heads. The colour is sublimated into the head surface, the result is absolutely abrasion-proof. We use durable and good quality P3 heads from IZZO which we especially order with no logo so your design comes out nicely. Simply upload your files and order online! - Please scroll down for the data sheet and the print specifications. Please make sure that your file matches our specifications or we will not be able to continue processing the data. - At the till you can upload your files as pdf or jpg. That's it! We recommend that you order a sample in one size before ordering larger quantities. Custom heads are custom-made products. empfehlen, zunächst ein Muster in einer Größe zu bestellen. So kannst Du das Druckergebnis überprüfen, bevor Du größere Mengen in verschiedenen Größen bestellst. Custom Samba Felle sind Sonderanfertigungen. Cancellation or exchange is not possible. We can only start production after receiving the payment in full. Caixa u. Snare Pandeiro bag 10"